Summer For Dogs - Quick Facts! What heatstroke can do to your dog, and what to do if you suspect a heatstroke in your dog? What to do and what NOT to do on a hot day with your dog? What dogs are the most susceptible to be heat struck? Having a coat of fur or long hair is great in the winter. However, when it comes to the summer, even shedding a bunch of that pesky undercoat doesn’t quite cool off your dog as much as it should. Protecting your dog in the high heat of the summer should be a priority. 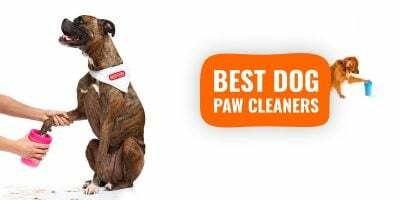 Here are five ways to do just that and don’t forget to use a dog fan in the meantime, and dog sunscreen if the sun is burning. Oh and… we’ve got several infographics below and they have all the info you want to get, in a visual way! The first way to protect your dog during the intense summer heat is to provide plenty of fresh water. Dogs need plenty of water to begin with, but during the summer months it should be on your mind to consistently check their water bowl. If you plan on having your dog outside, you should keep an eye on him or her at all times. Also, make sure there is a water bowl available outside for your dog to rehydrate itself. Heat stroke can come on without a moment’s notice so it is important to also have a fresh source of water easily available. Dogs drink running water much easily than compared to still water that’s standing. Check out the absolute best dog water fountains today on the market! Most owners opt to not use potty pads for their dog which is understandable. Therefore, you need to let them outside to do their business. However, during high heat, you should limit their outdoor activities. 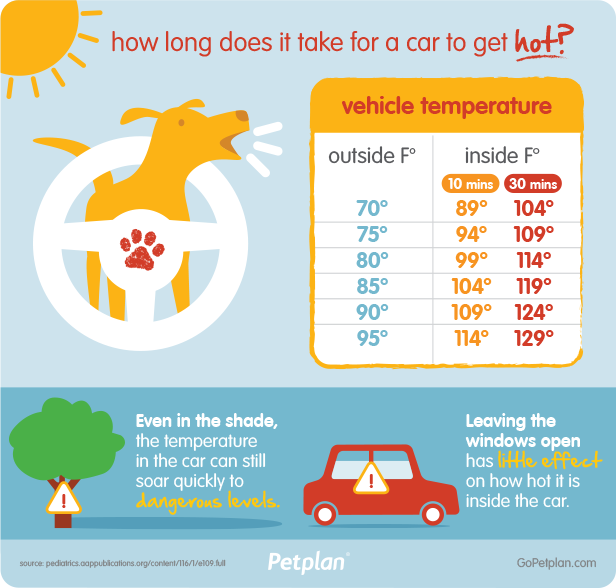 Dogs don’t understand that they can get heat stroke or are in danger when it is incredibly hot out. That makes it your job to limit the amount of outdoor exercise they get when it is hot. Allowing your dog to linger outside on a hot day will increase their chances of heat related dangers. 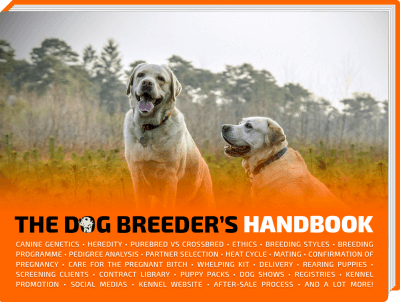 Provide your dog with ample time to do their business and a limited amount of exercise. After that, they should be brought inside to cool off before returning to the outdoors. We’ve got a big list of amazing dog pools reviewed here! Another way to protect your dog in the heat is to allow it to cool off the same way that you would; with a swim in the pool. If you own a pool, this may be the best time to let your dog go swimming. Taking a dip is not only a great way for your dog to cool off, but they will also get their exercise in which should otherwise be limited outdoors. If you do not own a pool, you can purchase an inexpensive kiddie pool and use the hose to fill it up. Set your dog in the kiddie pool and watch happiness ensue. Unless of course your dog is terrified of water. If you’d rather not go through the hassle of filling and cleaning a kiddie pool you can always use the sprinkler as a means to cool off your dog. This is another great way for your dog to cool down while getting exercise. A lot of dogs have tendencies to chase the sprinkler or try to nip at the streams of water. Another great way to protect your dog in the heat is to provide it with cold treats. You can always check out your local dog store for purchasable frozen dog treats or you can make your own. Peanut butter popsicles are quite the hit amongst dogs. Using simple ingredients such as unsalted, unsweetened peanut butter, bananas, and water, you can whip up a batch of these treats pretty quickly. Pop the mixture into the freezer and you have yourself a delicious treat that will also help your dog cool down. Finally, another way to protect your dog in the heat is to make yourself knowledgeable about the signs of a heat stroke. Heat stroke poses even more of a risk for dogs that are very old, very young, overweight, haven’t exercised for prolonged periods, or have heart disease. Even certain breeds of dogs can be more susceptible to heat strokes. Short muzzled dogs such as pugs, shih tzus, and boxers have a harder time breathing, thereby putting them at a greater risk of heat stroke. Some of the main signs of a heat stroke are heavy panting, glazed eyes, rapid heartbeat, difficulty breathing, excessive thirst, lethargy, fever, dizziness, lack of coordination, profuse salivation, vomiting, a dark red or purple tongue, seizures, or unconsciousness. 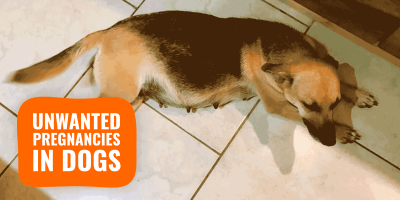 If you notice your dog exhibiting any of these symptoms you should immediately move them into a shaded area and begin cooling them off with ice packs or cold towels. Allow them to drink some water or lick ice cubes. Then immediately bring them to the veterinarian. 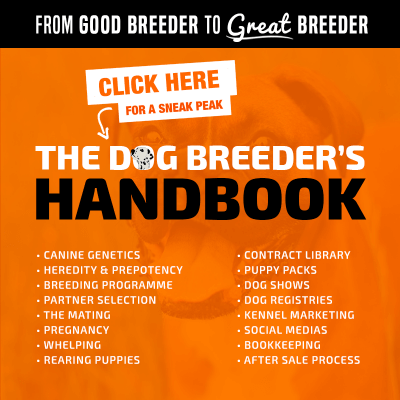 A lot, if not all, of your questions will be answers in a ludic and educative way with these eye-catching infographics that are all about providing the relevant care to your dogs during summer, and generally very hot days. 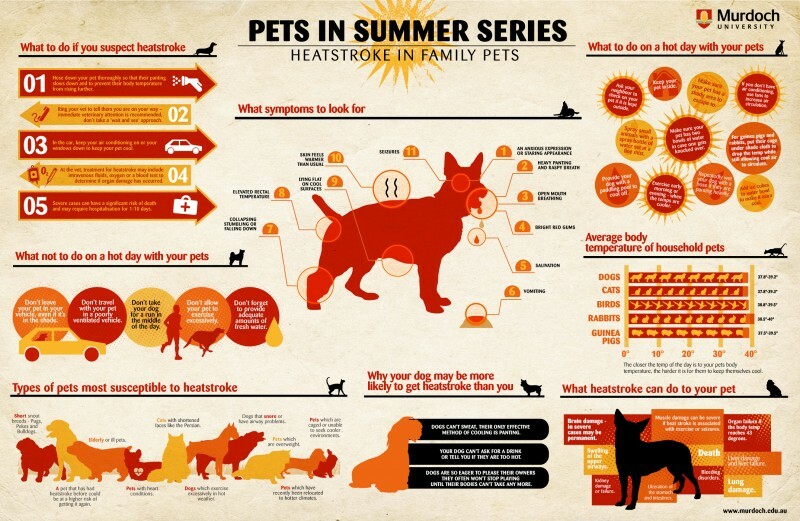 Without further do, let’s take a look at our curated list of the absolute best infographics about dogs and excessive heat. 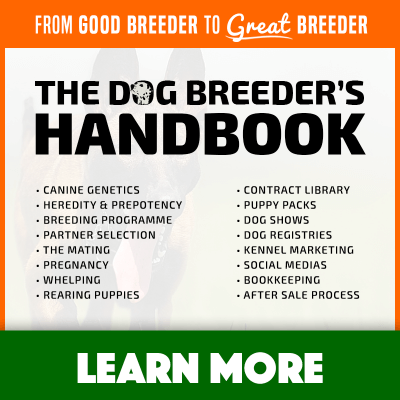 Summer For Dogs – Quick Facts! This is a simple and quick start for you all. It reminds us that heat strokes kill fast, whether you leave your dog in the car with the window open. 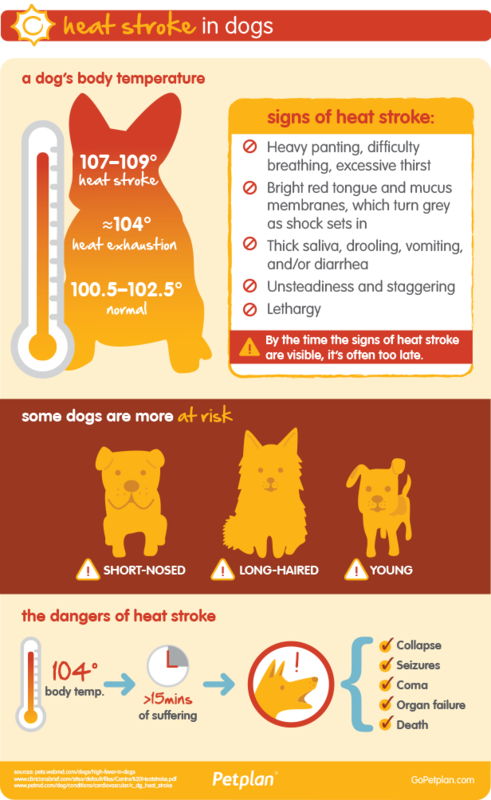 This infographic digs deeper and differentiate the levels of a dog’s body temperature. From normal, to heat exhaustion, to the sometimes lethal heat stroke. It gives the most common signs to be on the look out for, including heavy panting, drooling, and a bright red tongue. The dogs that are the most at risk are the short-nosed, young and long-coated dogs. The color black also increases the heat retention within the body. Spread the word about the dangers of leaving dogs in hot cars by sharing and tweeting this page. Because dogs do not sweat, the only way they can regulate their body temperature is through panting so cool air flows in and refreshes them. What happens when a dog is left on its own in a car, the dogs will inhale hot air and the body temperature will remain high, and will quickly get higher. Every second counts! If you see a dog left in a hot car, notify a store employee to have the owner called or immediately speak to your local law enforcement agency or animal control. 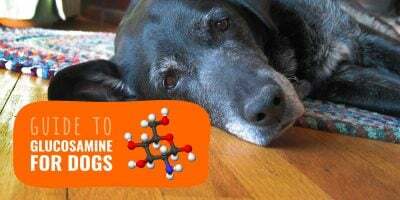 PetSafe is known for manufacturing and selling dog e-collars but here they give us some valuable information about the hydration needs for dogs, especially during hot days, and the warnings that appear before severe dehydration hits your dog. Make sure you know and remember the symptoms at any times, especially if you are trailing, hiking, biking, running, or simply exercising with your dog. Perhaps the most complete infographic about dogs in hot weather. It has been designed by the great Murdoch University and answers a lot of questions. This is a super piece of online content that everybody should print and bring to their vet so they can pin that on the wall! Here are some tips to keep your pet protected during the summer heat, and let your dog be a happy healthy pooch! I definitely agree with the Splash advice… My own border collie loves this, and does it whenever she spots water!